This series of audio blog posts recapping every season since 1987 were originally posted prior to the 2013 season and are sponsored by our friends at Blue Moon Disk. 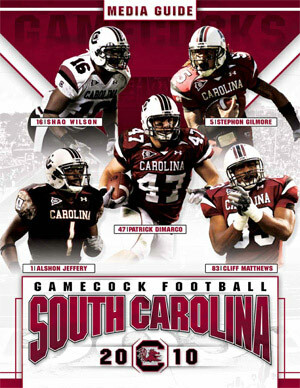 On the heels of the commitment of Marcus Lattimore, USC’s National Championship in baseball and the launch of The Rubber Chickens blog, 2010 was setting up nicely to be a big year for Gamecock football. Which it needed to be, as the Steve Spurrier era had been average at best through 2009. After a season-opening win over the fighting Larry Fedoras, Lattimore took over the annual battle against Georgia with perhaps the greatest single-game performance in school history. A tough loss at Auburn preceded a monumental win over #1-ranked and streaking Alabama…but then Kentucky. Fortunately that game didn’t derail our march to the SEC East title, which was clinched with our first ever win in the Swamp. A ho-hum victory over Clemson came right before our first SEC Championship Game, which was a tremendous experience despite the lopsided outcome. Click here or click the graphic to listen, and enjoy!